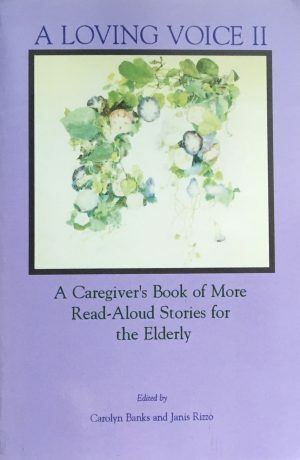 In response to readers overwhelming demand and following the huge success of their first book, A Loving Voice, editors Carolyn Banks and Janis Rizzo have compiled this second anthology of stories and poems written specifically be read out-loud to older adults. Like its predecessor, A Loving Voice II offers an imaginative and creative way for professional and non-professional caregivers, family members and friends to reach out to, communicate with, and entertain the older people in their lives and in their care, particularly those who are bed-ridden, confined to a nursing home or hospital and those with dementia. In a moment of inspiration that has been appreciated ever since by caregivers the world over, Carolyn Banks and Janis Rizzo came up with the idea for A Loving Voice when they recognized the desperate need for, and the serious lack of, reading material for this large segment of the population. Banks, who at one time worked in an adult day-care center, explains, "I could see that the read-aloud experience was something that mattered to the [older adults] I was reading to and I also discovered that storytelling was an excellent way to stimulate conversation and that it provided a wonderful experience." She was also concerned to discover that caregivers, at a loss for suitable read-aloud material for the elderly, were resorting to children's books. evoke nostalgic memories and warm feelings of the past, interesting stories that stimulate conversation, provide a bridge between the past and present and a bond between reader and listener. All of the selections can be read in one sitting (no longer than 10 minutes), are clear with easy-to-follow plots and simple dialogue that lends itself to reading aloud. Moreover, as Banks and Rizzo discovered, reading aloud is an intimate, warm and friendly activity that encourages physical closeness, something that is sorely needed as we age. As Carolyn Banks reports, "The pieces we have chosen are not insultingly simple. Even those who are able to read these selections on their own will find them engaging and entertaining. These are stories and poems with purpose, stories and poems with heart, stories and poems we are proud to present. Each we hope will help you find your own loving voice." Included are short stories and poems written by an impressive array of American authors including Michael Dirda (Pulitzer-prize winning book critic for The Washington Post), Judith Bell (winner of the Washington Prize for fiction and a regular contributor to Art and Antiques and Elle magazines) and editor Carolyn Banks, an author whose equestrian mystery novels have a large following. This book and its accompanying first volume has received critical acclaim from professional caregivers and grateful family members alike and has been enthusiastically reviewed in hundreds of papers, magazines and journals for its inventive method of communicating with and bringing joy to the older adult.